Orange oil is a folded essential oil with a high concentration of d-limonene, a slightly toxic substance. It is yellow to orange in color with tangy scent. It's extracted from the peel or skin of oranges by steam distillation or a cold process method. A "folded" essential oil means it has been distilled and concentrated even further from its highly concentrated state. Most citrus oils are found in folded versions, with the most common being five-fold or ten-fold. Folded essential oils are natural, stronger and purer forms of the original essential oil. Find orange recipes for skin, hair and scalp conditons! CAUTION! Essential oils are highly concentrated and extremely potent. They contain bioactive ingredients, which means their chemicals interact with biological systems. Never use large amounts of essential oils externally or internally. Never use them straight. They must always be diluted in a carrier oil, soap, lotion, or other buffering agent. Never use without knowing what their bioactive compounds are known to do. Orange oil has antiseptic and anti-inflammatory properties. It helps tone skin and revive texture. Minor scrapes and wounds are healed more rapidly. Get rid of blackheads and acne! Reduce muscle soreness and inflammation. 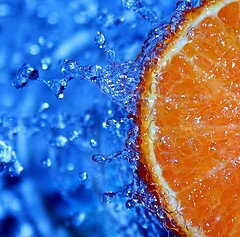 Follow orange recipes for skin! CAUTION! Orange oil can cause irritation to skin. This oil contains terpenes, compounds responsible for odors. Terpenes, in essential oils, cause skin to have photosensitivity to light. Terpenes in soap products are not a big concern, since soap is immediately rinsed off. They're a bigger concern when used in leave on products like lotions or lip balms. This stresses the importance of using a "folded" essential orange oil. HOMEMADE FACE MASK FOR OILY SKIN: Peel 3 organic oranges. Set peels aside to dry out for, approximately, 48 hours. Use a blender to blend dry peels into a powdery texture. Sift orange powder, disposing of any chunks. Place 2 tbsp. of orange peel powder in mixing bowl and set the rest aside, in air tight container. Add 2 tbsp. water to orange powder. Use a fork or whisk to mix, thoroughly, until a paste like texture. Apply, evenly, to face. Avoid eyes, ears, nose or any sensitive areas. Leave on face 25 - 30 minutes. Rinse face, gently, with warm water. (Do not scrub face when removing mask). Gently pat face dry. TIGHTEN & LIGHTEN SKIN: Gently rub fresh, organic, orange peel on face. Avoid eyes, ears, nose and any sensitive areas. Rinse face, thoroughly, with warm water. Gently pat dry. Orange blends with spicy oils and some flowery fragrances. Some complimentary blends include: sweet orange oil, bergamot, black pepper, cinnamon, clary sage, clove, eucalyptus, lavender, lemon, nutmeg, rosewood, sandalwood, spearmint, tea tree or yiang yiang. Use just a little orange essential oil in your homemade soap recipes. It has a strong, tangy, aroma. This orange goat milk soap has a combination of orange and spearmint. This homemade soap smells good enough to eat, but it's not for consumption! -- Try 5X Orange oil, an extremely concentrated version, for making homemade soap. This oil allows the orange scent to last long in your soap. Some people use sweet orange but this scent will fade over time. Sweet orange is similar to 10x orange oil, just not as nearly concentrated. -- A homemade soap with orange and lemon oils stimulates and freshens skin. It's a popping scent! ORANGE SOAP RECIPE: Melt 2 lbs of clear base soap over low heat. Stir in 1 tbsp. coconut oil, thoroughly. Do not allow mixture to simmer or boil. After melted, remove from heat and allow to cool. Next, add 1 tsp. lime essential oil, 2 tsp. mandarin essential oil, 2 tsp. bitter orange essential oil, 1 tsp. ginger essential oil and 2 tbsp. of grated citrus peel. Next, stir in orange coloring until your desired shade is reached. Pour mixture into prepared soap molds. Allow soap to cool and completely set. Next, remove soap from mold. Use a soap cutter to cut your desired size bars. For a nice finishing touch, use a potato peeler to bevel the edges of your soap. Your hand will have a better feel for the soap, since it's griping smoother edges. Save shavings to re-batch more orange soap! Looking for a specialty or soap making oil, just right for you? Find now! Orange regulates the production of hair's natural oil, sebum. The scalp can't maintain a natural pH balance without its natural oils. The natural oils protect the scalp against invaders, like fungus or ringworm. A homemade shampoo, with orange and tea tree oil, helps get rid of dandruff and improve oily scalp conditions. (CAUTION! Tea tree oil may be slightly irritating, for some.) Sweet orange oil helps remove toxins from skin and hair. ORANGE RECIPE FOR HAIR: Boil organic orange peels in water. Afterwards, let cool and soak. The liquid from the peels can be used as a hair rinse. Add shine to hair and get rid of dandruff! Air freshener, all purpose cleaners, insect repellents, wood polishing cleaners, leather restorative products, carpet or fabric cleaners. Orange oil is combined with other oils for a therapeutic massage.